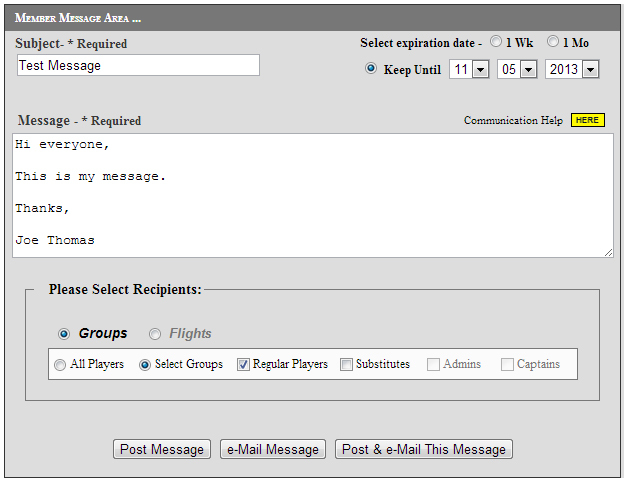 In the Member Message Area the Captain can quickly send an email to his/her entire flight or team. The Captains group will be pre-selected so all you have to do is enter a subject and a message and click the eMail Message button. You will be taken to the the mail page where you will receive a receipt for all the emails sent. You can copy and print the list if desired. The program automatically inserts a salutation and prints your name at the bottom of the email. It inserts the text that you will write in the middle. So all you have to do is write your message and then a “Complimentary close” if you like (i.e. “See you next week” or “Sincerely”), but do not sign your name. I purposely wrote "Hi everyone" and then typed my name in the message area and emailed everyone on a test league, as an example of what not to do. The resulting email was confusing to say the least. The email has two salutations and my name has been printed twice. As shown in the example above, do not write “Hello everyone ” or “Hi Guys” or anything of that sort. The program will have already greeted the member (as with “Hello Eric” in this example). When you send emails to your members, each member will receive an email with the greeting addressed to his/her own name. At the close, you can add something like "Thanks," or "Sincerely," but do not sign your name... the program does it automatically. You can send a message to yourself and look to see how it comes out when your email comes in. 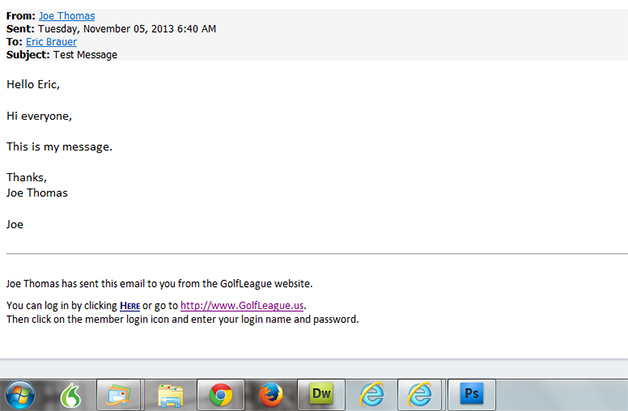 Click the "Just Me" radio button under the "Select Recipients" section, GolfLeague will send the message to just you. It's a good idea to post and send the message to yourself first. This is a good feature to preview the email before sending it to a ton of people. Enjoy the Communication Center, it's one of the many features in your GolfLeague software that will make your job easier!